this is real, as far as I can tell. 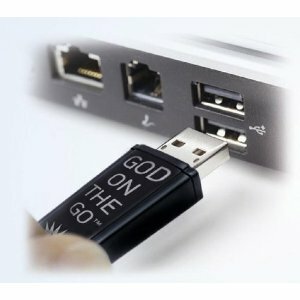 A different take on the e-book, God on the Go (pictured) contains the entire NRSV Bible, plus reading software, on a thumb-sized flash drive. Wherever you may be, just plug in to have your scriptures. on Amazon, $39.95. I used to collect bibliographic lists — Modern Library 100 best novels, for example — and put them up at my site LiteraryCritic.com. This was back in 2000 or so, back when I and the Web were young. For years it attracted book hunters who clicked from my pages through to Amazon, earning me commissions which, to my amazement, were sometimes as much as $100 a month. Now it’s just another moldering dead project, and I even lost the domain name by not renewing in time, losing it to someone sharper who… has done nothing with it. But I digress. I’ve resurrected the pages and put them at tjm.org/literarycritic. I might even update and add on to it. So, enjoy, and may I recommend Harold Bloom’s magisterial summation of the Western canon as he sees it. Also, send me any lists you’ve come across, no matter how obscure. In fact, obscure is good, because when Google crawls my site and finds the names of obscure authors and books, I get good Google rank on these items (because hardly anyone else on the Web mentions them). Thus I probably make more Amazon commission money on these obscurantists, searching for, say, 19th-century Hungarian authors. Global information publisher Thomson Reuters recently collected citations from the journal literature it indexed in 2007 — mainly academic / peer-reviewed journals — to books and their authors. Below is the list of the most-cited works/authors in the humanities and social sciences. (in the sciences, the journal rather than the book is the main communication vehicle). For a measure of your canonical literacy, or perhaps your academic orientation, see how many of these authors you’ve read something by. I’ve been so bold. From Times Higher Education (UK).